PageMutant Help - How do I include icons for my various social media profiles? How do I include icons for my various social media profiles? 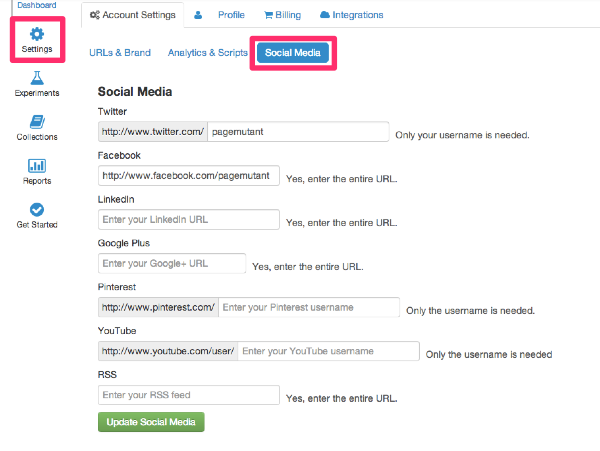 Social media icons will appear in your landing pages for any profiles that you have defined in your account settings. You can visit Settings > Account Settings > Social Media and populate the profiles of interest. We currently support the following icons. RSS - Yes, we know it's not a social media but some people still want to highlight the feed for their blog. Let us know if you would like to see other icons on the list. If you do not enter information for a particular profile that icon will not display on your pages.